The evidence is significant in part because it was believed for more than two decades that there was no functional linkage between the two molecules and that Rho GTPase acts predominantly by regulating cytoskeletal organization. "Given the diverse and important roles of Rho GTPases such as in cell morphogenesis, cell movement, cell-cell communication and wound healing, dissecting the Rho-mediated transcriptional control mechanisms will help us understand how plants and animals grow and develop, improve their response and adaption to biotic and abiotic stresses, and help cure human diseases," says Zheng. 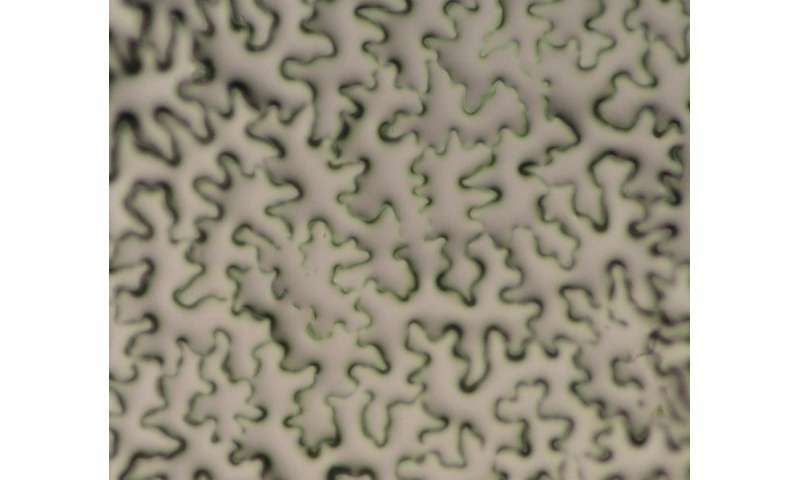 "We provide genetic and biochemical evidence that links these two molecules in an intracellular signaling pathway,"
His lab first used the Arabidopsis plant's leaf epidermal pavement cells as a model system in the genetic study. The pavement cells normally have a jigsaw-puzzle shape, but they can change to the hyperparallel and near rectangular shape if ROP2 GTPase is constantly activated. Humans and plants have billions to trillions of cells that form various tissues and organs. These cells exhibit diverse shapes, which is critical for cell and body functioning. The dynamic regulation of cell shape is important for all living organisms in their growth and development. "Our finding provides a strong support for a direct or shortcut model in transcriptional control," says Zheng. "Compared to the classical transcriptional activator/repressor-mediated indirect model, this shortcut model by targeting the core of Pol II, likely provides an efficient transcriptional control to rapidly bring about the broad changes in gene expression." In molecular biology and genetics, transcriptional control or gene expression regulation, is the way in which a cell regulates the conversion of DNA to RNA, which in turn directs gene activity. "The biological process affected is cell growth and shape formation," says Zheng. "This could be important not only for basic biology but also for providing new targets for treating diseases such as cancer. The finding that both Arabidopsis and yeast use the same signaling shortcut in regulating the cell shape is amazing, given that these two kingdoms diverged more than a billion years ago. It will be interesting to test whether the similar signaling shortcut in transcriptional control also works in animals including humans."